Made-in-India Yamaha supersport model YZF-R15. 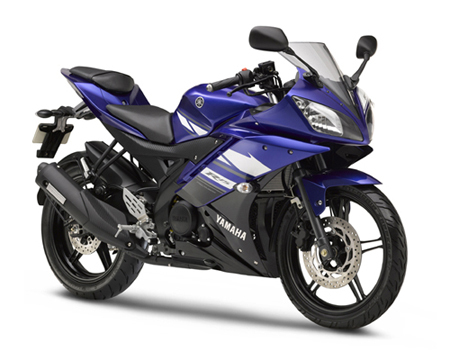 Wins prize in 1st edition of the prestigious India Design Mark (I Mark) Awards - News Releases | Yamaha Motor Co., Ltd.
Yamaha Motor Co., Ltd. is proud to announce that the 150cc sport model YZF-R15 manufactured and marketed by group manufacturing base India Yamaha Motor Pvt. Ltd. (IYM) has won the coveted India Design Mark (I Mark) awarded by the India Design Council. The India Design Council is affiliated with India's Ministry of Commerce & Industry and is made up of eminent people in academia, design and industry organizations. Its India Design Mark (I Mark) awards program was organized with the cooperation of the Japan Institute of Design Promotion, organizers of Japan's Good Design Award (G Mark), and preparations began in 2010. Adopting the same high standards as its Japanese equivalent, the submissions and judging for the first edition of the India Design Mark Awards was completed recently and the winners announced. Of the 71 applicants, 31 were awarded the I Mark, and the Yamaha YZF-R15 was one of four products from three Japan-based companies to receive the coveted award. In the Indian market, where motorcycles are viewed primarily as practical forms of transportation, the YZF-R15 was launched in 2008 under a unique product concept that proposed the "fun of riding" as a new priority of value in a motorcycle. Its subsequent success as the first full-fledged "supersport" model in its displacement class succeeded in boosting Yamaha brand value in the Indian market significantly. In the autumn of 2011, the YZF-R15 underwent a model change that gave it an even sportier design. The model stands out for its body design based directly on the Yamaha supersport YZF-R series models, and is highly regarded for its sporty performance, comfortable ride and ease of use in around-town riding. Comment from Kazumasa Sasanami, Designer for the YZF-R15, GK Dynamics Inc.
We are honored for the YZF-R15 to be bestowed the India Design Mark (I Mark) in the first edition of the awards out of so many entries. I believe that this award recognizes not only the styling of the YZF-R15, but the world-class quality of all Yamaha Motor products and the philosophy behind our engineering, manufacturing and marketing. Accepting this award strengthens our dedication to work towards creating more new and attractive designs.